For those of you who worry or just wonder, the latest action involves unhappy, cold poor people who held demonstrations against lack of electricity in their areas. A few people were killed in confrontations with the Army, I think, though this just happened in the last few hours and details are scarce. Roving power cuts are part of life here, but apparently they hit South Beirut disproportionately, and of course those people are less likely to have backup generators like we do here in Ras Beirut. Nice to know: I got three text messages on my UN-issued cell phone this evening about the situation, saying exactly where it was and advising me to stay away from the area. UN security is really on top of things. This week's bomb killed one of the main investigators of the Hariri assassination, his bodyguard, an army person, and at least three bystanders. It was the third attempt on his life. Following last week's car bombing of a US embassy vehicle, teachers at Tom's school were told by the embassy to "avoid popular gathering spots," and the UN van that picks me up in the morning now has the "UN" letters covered over with masking tape. The realization that many of the people I (K) work with have lived their whole lives in an urban refugee camp. They leave each day to come and work at UNRWA offices, but go back "home", and can never leave the country or even do the same jobs they do in a Lebanese company. Sigh. We are fine. It was nowhere near where we live or work. Standing on the corner at 6:45 am waiting for the UN van to pick me up. The van will fill with one Japanese, one Malaysian, a Brit, a couple of Palestinians, 2 Aussies of Lebanese extraction, and 1 American: moi. We weave through neighborhoods and arrive half an hour later at the UNRWA compound, where we go through bomb check before entering. Yes, car bomb check--it is quite routine in these parts. Yet I feel safer here than almost anywhere I can think of. I walk alone anytime of day or night without fear, without the subconscious judging of approaching males for attack potential or clutching my purse as I enter a crowd. I can assume that strangers will treat me courteously and fairly, and likely go out of their way to help. Passengers on the bus pass money down the aisle from person to person to pay their fare, and the driver passes change back to them. It gets there. Still no president, true. The election has been postponed something think 14 times now. I’ve heard two theories on the car bombings: that its the Syrians, in an effort to destabilize the country, and that its the Israelis, ditto…. Yet there is lots of construction, symbol of faith in the future. Older buildings of 4 or 5 stories and lots of charm are being torn down in favor of 10 -12 and more storey towers, not all predictable and square (sometimes I think this is where the world’s architects come to be fanciful). Business carries on, and schools and shops and streets are full. People just want to live. Beirut is a comfortable city, and safer than most. This one apparently targeted a US Embassy vehicle, which is new. Up 'til now it has been members of parliament and government figures. Two Embassy security guards were injured. Some are blaming the Syrians, trying to destabilize the country (many in Syria have never gotten over the fact that Lebanon is a separate country). It happened in suburban Beirut, several miles from where we are. Cairo. Hazy air, mostly brown buildings, clogged traffic, occasional lovely architecture. Then there’s Maadi, where the fortunate—lots of expats—live: shady, tree-lined streets with a suburban feel. Shops and clubs and American restaurants. Villas with gardens. Very pleasant. Across town lie the ancient wonder of the Pyramids, guarded by the Sphinx, which we discover has a tail curled round back. This is a land of contrasts, a monumental place. All four Moores are here and joined by K's sister = Aunt Margaret, and Tom's twin Tim and wife Cathy, who live in Cairo. The overnight train takes us south to Aswan. 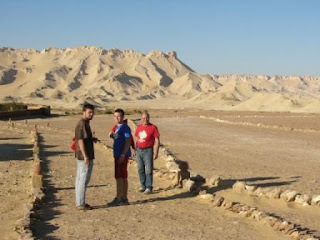 Tom, Ben, Cam and their Uncle Tim get up at 3 am to travel in a convoy to Abu Simbel. The ladies stay behind to [sleep and] visit the Nubian Museum, and have lunch overlooking the Nile at the historic Old Cataract Hotel. The roads, plied by horse-drawn carriages seem as if lined with touts, wanting us to ride or buy from them. 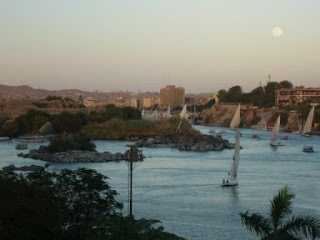 We take a Felucca (sailboat) ride at sunset on the Nile—so lovely. 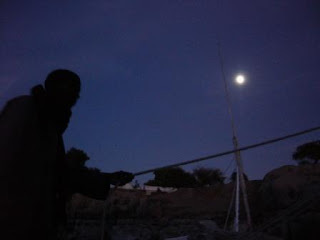 The boatman points out an ancient monastery carved in the rocks and Aga Khan’s tomb, and he sings a Nubian song to us. Night has fallen and there is a full moon. Tom and I dance with him to his music. 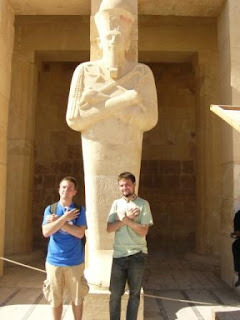 On to Luxor, stopping at three temples on the way, including the Temple of Horus and another to a local crocodile god. One is so well preserved that you are able to see the riotously colorful and lavish decorations—I found myself thinking that if it hadn’t been fading for 5000 years the color scheme would have given me a headache. 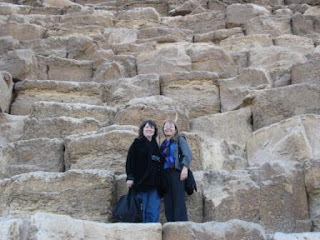 In Luxor we see the ancient temples (layers of Greek, Roman and Pharaonic) at Karnak one day and then climb aboard donkeys to visit the Valley of the Kings the next. What a marvelous way to travel—slow enough to see the world, and surprisingly comfortable. Egyptian donkeys are easy to get off and on (well, OK, in theory--we were not graceful about it and did actually fall a couple of times). We start off down the road, being passed by local cars and tour buses, detouring around minibuses stopped to load and unload passengers. 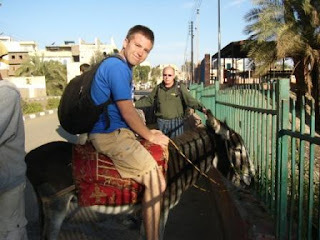 Then it was off on trails up and over a ridge, walking the animals in the steep or narrow parts, and taking in the sweeping view of the Nile. We leave the donkeys with the ~12 year old boy who is our guide, and descend into the valley. We pay the hefty entrance fee and learn it will gain us access to three tombs. Tutankhamun’s (empty) would be an extra $18 and we decline. 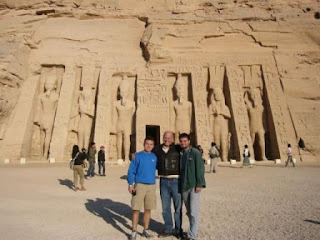 We pick three tombs and join tourists from all over the world inside them. All the treasures they contained have long since been removed to museums, but the size and age and the very idea of the pharaohs are all stunning. Amazingly, some of the paint that decorated the tombs yet remains. 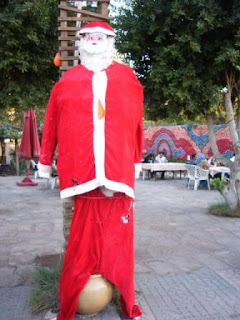 We also have Christmas at Luxor, exchange presents we've lugged from various corners of the globe, and partake of a feast at our hotel, with belly dancing and a twirling sufi-esque dancer. Egrets in rice fields—even in the oases—how do they get there? We pass hills and great mesas—sand colored, some areas with black on top, one stretch for several miles all white, and dotted with great white towers--pillars—of white stone. It’s like another planet. In one sand colored area there is a band of white along either side of the road, reminiscent of a snow-plowed roadway—it looks like salt but we learn later it is limestone. A closer look as we stop at one of the checkpoints reveals chips and slabs that look like the marble-like bricks that some houses are built of here. All limestone. But the desert gives way to Cairo. 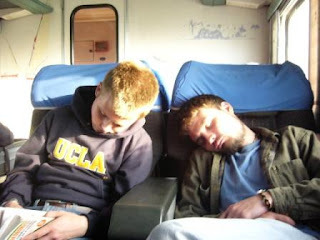 The last two hours of the ride are just crossing Cairo. We learn later that Nicolas Sarkozy is visiting Giza, and that he is to blame for some of the traffic clog. ALEXANDRIA—a city to fall in love with (and in, no doubt). The view from the train coming in from Cairo two hours away starts out with dense, brick and concrete multi-storey buildings and trash heaps, that give way to increasingly green fields and some water buffalo, dotted with Sideshow Bob palms. Alexandria curves around its long Corniche (seafront) walkway—its signature. It is the site of the Pharos lighthouse, ancient wonder of the world that was repeatedly repaired but finally fell down in the 15th century, and witness to the offshore island where Cleopatra and Mark Anthony committed suicide together. Ben and Cam got to scuba dive in and just outside Alexandria Harbor. 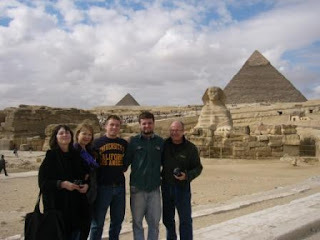 They saw two sphinx statues that were remnants of Cleopatra’s palace, an Italian World War II plane, Roman columns, ancient Roman and Greek pottery, and Pharaonic temple ruins. Wow. We had our best Egyptian mezze meal there (also our cheapest at 30 pounds = $6 for four people!) then spent nearly that much for three ice creams at a fancy patisserie. We basked in the great service at Le Metropole, an elegant 1930s French Hotel just off the Corniche. The last day of our trip--and our time together--we spend walking around Alexandria and scouting for souvenirs. Where these are impossible to avoid in Cairo, they are actually hard to find in Alexandria. The train to Cairo brings us to the inevitable departure. The boys—Cam at 18 ½ ,with full beard and a furrowed brow, will be off to Africa next week on a mission to set up a drug rehabilitation program. Ben, neat and strong and focused at 20, goes back to UCLA and a foreign service career path. Tom and I to Beirut, T an artist at helping children blossom and learn, K to a demanding new job she’s not sure she’s equipped to do. Lebanon seems very appealing to us after Egypt, though: no demands for baksheesh, unfailing shopkeeper honesty, and good food! Border formalities took time—exiting Lebanon, entering Syria, through numerous checkpoints and under concrete archways festooned with large pictures of Bashir Assad, President of Syria (and son of former President Hafez Assad). We got great stamps in our passports—five actual paper stamps stamped with rubber stamps on top. 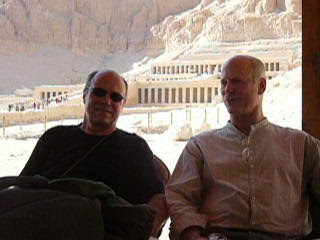 We have only 24 hours in Syria, out of Ben’s 3 ½ days in the Levant… We leave for Egypt Tuesday! 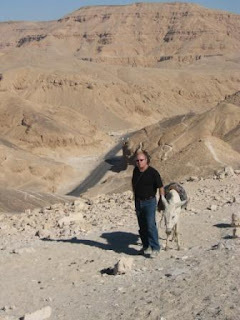 Immediately the scenery is different from Lebanon: incredibly rocky and almost lunar. Much less green. It seems poorer than Lebanon, less modern and way less cosmopolitan. But, as in Lebanon, people are outstandingly friendly and hospitable, which is truly a wonderful thing. Ben went into an Internet café and sat down at a computer that said “this computer has been blacklisted.” An hour of internet use was $1. When he tried to get into Facebook he got a message saying the site could not be found. The café worker noticed his difficulty and came over to help. I remembered that Syria had banned Facebook... The worker came to Ben’s machine and tapped into an Asian (Chinese?) program that broke the encryption and allowed it to run. That’s life in Syria. We spent most of our short visit in the Old City, especially the extensive souk. It is a lovely place, with high vaulted ceilings and chandeliers, several mosques, Roman ruins, a church or two, and lots and lots of things to buy and to eat. One mosque is the marvelous Umayyad Mosque, the third most holy site of Islam after Mecca and Medina. Worship at this location dates back to the 9th century. The existing building was previously a temple to Baal and then Jupiter, and then a Christian church. It is said to hold John the Baptist’s head, as well as that of Hussein, grandson of the Prophet Mohammed. It is popular with Iranian visitors, as it is a Shia mosque. A sweet Iranian lady in black started talking to me and asked why Bush hates Iran? She said she loved American people. I cried. Her mother blessed me and kissed me; she smelled of rose water. A billboard advertises: Sham Wings Airlines. (I think Sham is another name for Syria). A fine adventure, but we were happy to get back to Lebanon. Tom and I will come back to Syria someday, but to the north—Aleppo and Krak de Chevaliers—as we had hoped to over Thanksgiving break.